It’s back to school season! 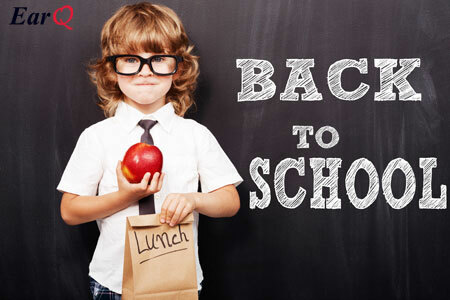 Time to get the backpack ready, buy some school supplies, get a lunchbox packed - and find ways to help your child with hearing loss succeed in the classroom. Help your child speak to their teachers and peers. This is a difficult challenge for some kids, but it’s important for them to advocate for themselves. This allows them to excel in the classroom and in social settings. Remind them that it’s okay to ask for help. Teachers choose this profession to share knowledge and help students thrive in and out of the classroom. If your child misses information or needs extra assistance, reassure them that it’s okay to ask questions in class or approach a teacher after class. Set up an IEP (Individualized Education Plan). This legally binding plan will establish a common ground between you, your child, and their school. With an IEP, the teachers and school system will be able to best accommodate your child. Public schools, by law, have to abide by an IEP. Within an IEP, the things your child needs to effectively perform in the classroom are written, and accommodations that need to be made will be noted. Basically, it’s a guide on the essentials needed for your child’s success up until high school, and then a foundation for post-graduation. If your child already has an IEP in place, review it to make sure it is still appropriate and meeting their needs. Get the proper tools for accessibility. There are many devices beyond cochlear implants and hearing aids that can help your child perform to their full potential in the classroom. Some students learn best with a personal listening device like an FM system. Teachers wear it around their necks to amplify their voices. This allows the student to spend less energy trying to understand the teacher and focus more on learning! If your child struggles with following along and taking notes, you can request a note-taker. Some schools provide one from outside the classroom, or assign a student in the class that is a good note-taker to make duplicates of their notes. Having a preferred seat in the classroom that allows for better visibility and hearing is very helpful. Speak with the teacher and have your child choose the best seat in the classroom before they start their first day. There are many other tools for accessibility that you can take advantage of. Discuss them at your IEP meeting. Encourage them to participate in after school activities. Kids are a bundle of energy - and kids with hearing loss aren’t any different! In fact, after a long day of listening, letting loose in sports, art, music, and other interests give them a chance to learn in a different way and be a kid. Remember to have your child take a break. After school activities are always encouraged, but if your child has been working tirelessly listening in the classroom, have them take a break to do something that doesn’t require extra effort to hear. Some good suggestions are reading a book, playing board games, going outdoors, or watching an hour of television with closed captioning on! Check in periodically and make sure they’re doing well. A simple, “How’s everything going at school?” or “Are you getting everything you need?” can make all the difference. Even something as small as leaving an encouraging note in their lunchbox can give them an extra boost to get through the day! It’s also important to maintain communication with your child’s teachers. This ensures that they are getting the support they need and excelling in the best way possible. This goes for any adult figure in your child’s life, whether it’s a teacher, friend’s parent, or coach. It’s important you can talk to them about your child’s hearing loss. Meet with a hearing healthcare provider. Before the school year starts, meeting with a hearing healthcare provider is highly recommended. Get those hearing aids/cochlear implants checked out and make sure they’re ready for learning! It’s all about being a strong support system for your child with hearing loss. A conversation goes a long way, and being proactive about their education will help your child excel. To make sure your child is off to a good start this year, schedule a hearing appointment today!